WHY DYNO TUNE YOUR BIKE? When you purchase a new motorcycle, your engine’s computer is already tuned to work with the components that came with it. When you modify or change those factory parts, your engine is no longer optimized; the computer map is no longer calibrated to the component(s) on your bike, and you need a new map. This is what dyno testing is all about. If your motorcycle has a new exhaust system, high-performance air filter, or other engine modifications, you will greatly benefit from having fuel delivery and ignition timing that matches the engine’s new characteristics. Bhp Motorsports applies most cutting-edge technology available to do just that. By measuring torque, horsepower, engine RPM, and the air/fuel ratio for your motorcycle, Bhp creates custom air/fuel and ignition maps that will match your motorcycle’s engine configuration. While many aftermarket electronic fuel injection (EFI) controllers come with a “base” fuel map for your year, make and model of bike, no two engines are alike. Power tuning with the engine under a load on a dynamometer is the only way to ensure optimum performance. 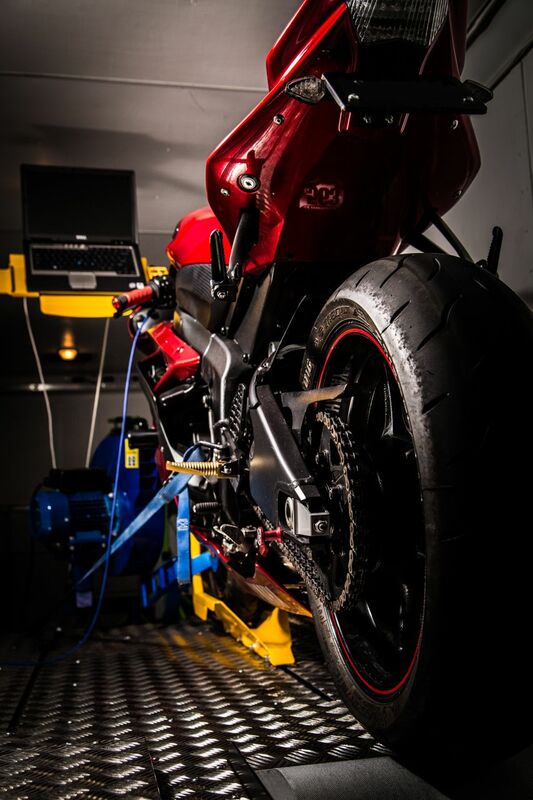 Dyno tuning your motorcycle will offer smoother running, better roll-on acceleration, more power and additional fuel efficiency. The dynamometer has made a huge impact on the industry. Most racing teams use a dynamometer to tune their bikes. These days, you are at a disadvantage if you frequent a shop that does not have a Dyno. It has become the industry standard and a shop without one simply cannot provide the state-of-the-art technology and service that a shop with one can. The dynamometer measures the horsepower and torque delivered to the rear wheel which is charted on a graph. This graph displays the horsepower and torque through the entire engine RPM range. The technician will use this information to tune the air/fuel mixture and ignition timing for maximum performance. With data collected from a dynamometer the mechanic can actually see if his adjustments increased performance and by exactly how much. This takes the guesswork out of tuning. WHAT IS HORSEPOWER, TORQUE, AND AIR/FUEL RATIO? Horsepower is top speed, and torque is what gets us there. Air/fuel ratio is how much air and fuel are mixing and entering the combustion chamber. This is how rich or lean the motor is running. Either end of the scale will cost you power, torque, economy, and efficiency. If you get the balance too far out on the lean side, damage can be done to the motor. If you get unbalanced to the rich side, you can foul spark plugs, dilute your oil with gasoline, and generally cause a noticeable reduction in performance. For the most part any motor that has had changes made to the intake or exhaust system, is using race fuel, or has any engine modifications will need to be tuned for the components added or changed. It makes no difference if your bike is carbureted or fuel injected, both can be dyno tuned. Dyno tuning usually requires purchasing a fuel management device or ignition control device. When you combine installing performance parts, a fuel management device, and dyno tuning, you will immensely improve your riding experience. WHAT OPTIONS ARE AVAILABLE FOR MY FUEL INJECTED BIKE? Aside from these add-on devices, there is the option to use the bike manufacturer's tuning kit. Some kits are a basic handheld device that plugs directly into the stock wire harness. Others use a sub-harness to connect a bike to a laptop. All adjustments are saved in the stock ECU (engine control unit). Using these kits will allow for +/- adjustment of fuel injection and ignition timing at various operating points along the rpm range and throttle position. This degree of adjustability allows the user to take complete control of their engine mapping, enabling the rider to fine-tune the engine to their riding style. Ignition control devices are available and allow you to make +/- adjustments to the ignition system. Making adjustments to your ignition timing is beneficial for people using race gas, high compression pistons, and performance cams. WHY IS A CUSTOM MAP BETTER THAN A MAP DOWNLOADED FROM THE INTERNET? There are differences in each motorcycle, even between the same make and model side by side. Maps downloaded off the internet, or installed in a new piece of performance hardware are designed to get you close for your bikes modifications, but that doesn't take into consideration altitude, ambient temperature, humidity, location, or the differences between each bike. By setting the air/fuel ratio for your specific motorcycle, we can get all your bike has to offer in drivability AND horsepower. Any performance items you add to your bike will change the emissions from your motor. This may or may not be legal depending on the state you operate your motorcycle in. Fuel management devices are not compliant with the Environmental Protection Agency (E.P.A.) or California Air Resource Board (C.A.R.B.) for use on public roads or lands. These products are for closed course competition only. Additionally any Harley-Davidson crossed flag performance parts you install on your Harley-Davidson or Buell may affect your warranty.